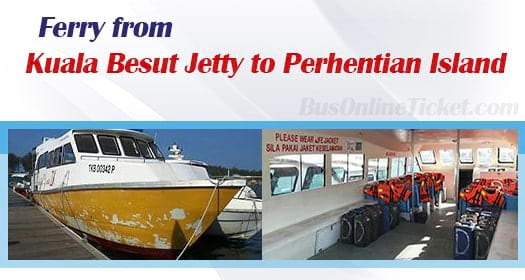 Perhentian Trans Holiday Sdn Bhd is the only ferry operator that offers online booking for ferry from Kuala Besut to Perhentian Island at BusOnlineTicket.com. Perhentian Trans Holiday Sdn Bhd was established since 2004. Hence, passengers can rest assured because they are well-experienced in providing their ferry service for this route. Book your ferry to Perhentian Island in advance online to ensure you have secured your ticket before the journey. The trip duration for the ferry from Kuala Besut to Perhentian Island can take around 30-45 minutes by speedboat, depending on the weather and tidal condition. The ferry departs every one hour starting from 8:00am until 5:00pm daily. The ticket price for ferry from Kuala Besut Jetty to Perhentian Island is RM35.00 per way. You can actually go to the Kuala Besut Jetty by taking express bus to Kuala Besut. Kuala Besut Bus Station is located nearby, around 1 km away from the Kuala Besut Jetty. There are many express bus services going to Kuala Besut. Perdana Express offers comprehensive bus service such as bus from KL to Kuala Besut, Ipoh to Kuala Besut and from Cameron Highlands to Kuala Besut. You can also book your bus tickets to Kuala Besut at BusOnlineTicket.com. The amazingly gorgeous island offers various spots for snorkeling and scuba diving. It is the perfect location to get away on your weekends or school holidays. You can just relax and embrace the nature, the crystal clear water and the pristine beaches underneath the blue sky. There are many nearby islands you can explore by island hopping too. Other popular activities on the island include sun-bathing, kayaking and jungle trekking.